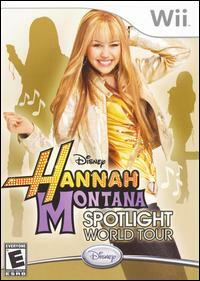 Hannah Montana: Spotlight World Tour lets gamers step into the shoes of the pop princess and live the life of a budding star. Players can use the Wii Remote to dance to and perform 15 of Hannah Montana's hit songs on stage and interact with the crowd to earn new fans. Off stage, players can design unique wardrobes, select concert special effects and pyrotechnics, and shop for clothing in cities like London, Paris, and Tokyo. Hannah is joined during transitions and mini-games by her friends Lilly, Oliver, Jackson, and Robbie.